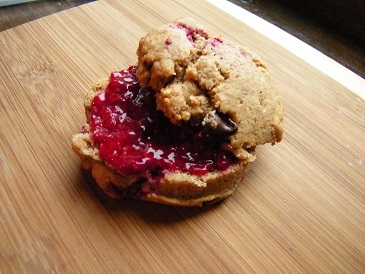 While this scone recipe is not completely my own, we all have to start somewhere. Someday I aspire to create my own scone recipes, but for now I’ll adapt the recipes of others until I get to that point. 2- Meanwhile, mix the dry ingredients and stir with a whisk to ensure they are well combined. 3- Then, after melting the 1/3 cup of coconut oil, combine the coconut oil, agave nectar, and vanilla extract. Stir once and then pour over the spelt mixture. Gently mix together. 4- Add the hot water and again gently mix until it’s combined (try not to over mix spelt flour). 5- Fold the chocolate chips and the raspberries into the batter. Use a 1/4 cup measure to spoon batter onto a parchment-lined baking sheet (to ensure that the scones will be the same size). Bake the scones for 15-20 minutes or until they are golden brown on top. These kept well in an air tight container for 3-4 days. I stored mine in the fridge and heated them in the microwave before eating. They taste great with fresh raspberry jam, if you have any on hand. *If you missed my version of ginger peach scones, find the recipe here. MMMMM! I made your beautiful scones & they were superb!!! Amazing even! Yay! I’m so glad they came out as good for you, as they did for me 🙂 Thank you for your feedback also! You are welcome! 🙂 !! !